He catches the ball on the wing, and in an instant, a blur is zipping along the perimeter to a teammate. One dribble, then he’s on the move, either with or without the ball. Slotted in the corner, there’s a catch, a wind up and a hoist over the shoulder. When Patrick Patterson touches the ball, the triple threat is real, and it’s immediate. Last season, however, Patterson’s first with the Thunder, he didn’t threaten the defense quite as much as he hoped. Coming into training camp, Patterson was still recovering from a knee procedure and had to work his way into the flow of the game on the fly once the season started. A step behind to start the year, Patterson’s role ended up being a 15-minute-per-game player, with averages of 3.9 points on an admirable 38.6 percent three-point shooting, along with 2.4 rebounds per game. 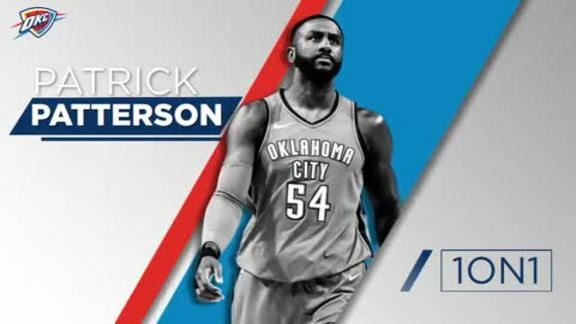 In 2018-19, the Thunder and Patterson himself believe he can contribute more, not just on the stat sheet but also in terms of the team’s overall gameplay and style. The numbers bear out the truth behind Presti’s statement. Per 36 minutes, Patterson’s numbers look much more similar to his career averages – the resume created by stints in Toronto, Houston and Sacramento that was so attractive to the Thunder. With more playing time this year there’s a belief that his 20.7 touches per game (9th on the Thunder in ‘17-‘18) will increase and Patterson’s rhythm and shooting stroke will be more potent. Advanced statistics are also quite kind to Patterson, whose catch it, shoot it or move it approach falls in line with the up-tempo direction the Thunder wants to go. Last season Patterson held onto the ball for just 1.32 seconds per touch, the 12th quickest amongst NBA players who saw action in more than 10 games. On the Thunder, Patterson’s 0.43 dribbles per touch were more than only Steven Adams and Andre Roberson. Both numbers are a sign of Patterson’s quick decision making, and willingness to keep the ball zipping around the floor. At the end of last season, Patterson said that having an offensive identity and sticking to that style of ball movement and ball sharing will be important. Patterson added that “Russ still being Russ”, and the rest of the team playing to their strengths is ideal. 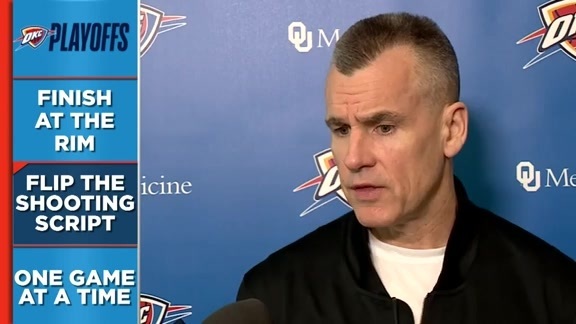 After the offseason Presti has put together, Head Coach Billy Donovan may have the opportunity to ensure that each weapon on the roster can be maximized. Ultimately, Patterson’s belief is that maintaining a consistent approach each night can help with the Thunder’s consistency issues from last season. The power forward’s personal health coming into the year could do the same for his own contributions on the floor. With a full training camp to get his legs and timing underneath him, Patterson hopes to be able to amp up his performance. That primarily involves getting into position early and doing the little things that have made him a crucial contributor to high quality teams, like making extra efforts on the glass and playing the two-man game with screens and dribble hand offs. Having that extra burst and athleticism can also help immensely in what appears to be the plan for the Thunder’s defensive scheme – to switch nearly every screen on the floor. Being able to jump out onto the perimeter and be sharp with communication will be paramount this season. It remains to be seen where Patterson will slot in this Thunder rotation. He’ll have dynamic All-Star playmakers in Russell Westbrook and Paul George leading the attack. Adams, the Thunder’s burly yet agile center, will patrol the paint. Respectively, newcomers Dennis Schröder and Nerlens Noel will add an extra pop and verticality into the attack and veteran point guard Raymond Felton provides stability. 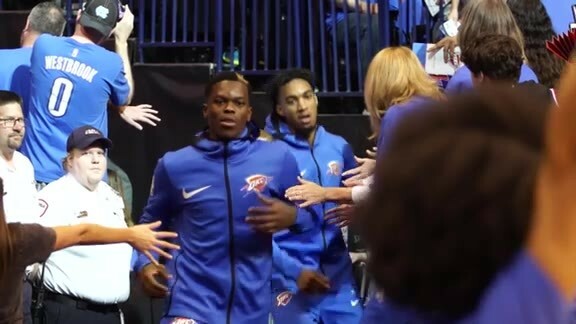 Along the wings, the Thunder is chock full of young guards and forwards like Roberson, Jerami Grant, Alex Abrines, Terrance Ferguson, Hamidou Diallo, Timothé Luwawu-Cabarrot and Abdel Nader, who each bring a unique flavor to the lineup. That leaves Patterson as a crucial swing player for this Thunder squad – a veteran stretch-forward who understands the nuances of NBA defense and the intensity of playoff basketball, with the shooting prowess and playmaking ability to be a threat from the perimeter. That’s a very valuable skill set in today’s three-and-D league. This year, it’ll be up to Patterson to take a step forward, and for the Thunder to utilize his abilities more fully.